T he Field of Flags had it beginnings eight years ago. 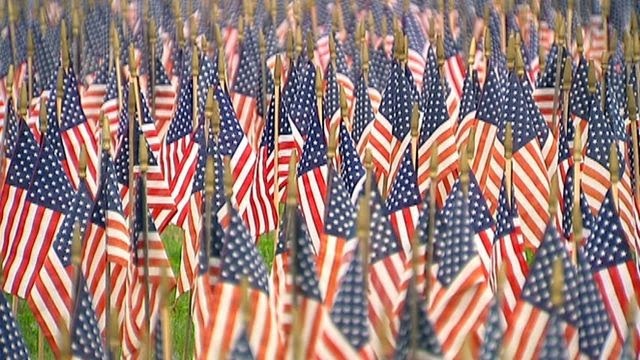 As we read in previous bulletins, each of the 6,700+ flags represents a casualty in either the Iraq or Afghanistan war. About a year ago when it was suggested to me that we have it on our parish grounds, I said "yes; anything that is good is worth doing if we can." And this event is certainly good. It is commendable because it shows our deep appreciation for what our fallen heroes have done for us. Each went to war knowing that they might not return or that they might return maimed and scarred. These men and women sacrificed for us, so that we might continue the life that we know. A year ago I had no idea what this Field of Flags involved. It was only in mid summer that, what I thought would be a relatively few flags to represent our fallen, would actually amount to several thousand. I did not realize that we would need so many volunteers to accomplish this tribute. But, there is no question that all the planning and work is more than worth it. We could never adequately express our gratitude for each hero's sacrifice. We could never sufficiently console the loved ones of those killed in these wars. Our efforts are insignificant to the cost of their self-giving. May we not only remember these fallen heroes, but also pray for them and their families and friends. Prayer is the reason why the Field of Flags began at a church in Connecticut in 2005 and why it has occurred on only church grounds since. We are all a part of the family of mankind; we are children of God. As we all know, the loss of one life has ramifications. Like ripples formed by the toss of a pebble in a lake, death of a dear one affects many. As we are in the midst of the Novena to Saint Michael in preparation for our parish feast day, let us add to our intentions these soldiers and the soldiers who have lost their lives in other conflicts. Let us pray also to our patron to protect all military personnel as well as our police. May God watch over the ones who deserve our immense gratitude. Cadet Glee Club of West Point - "Mansions of the Lord"